All the Diyas of the world cannot be compared even to a ray of the inner light of the Self. Merge yourself in this light of lights and enjoy the Happy Diwali! Diwali is the largest Hindu festival, celebrated in India and all over the world with joy and enthusiasm. Other religions observing Diwali include Jains, Sikhs and Buddhists. The name Diwali is itself a contraction of the Sanskrit word Deepavali, which translates as "row of lamps." Diwali involves the lighting of small clay lamps filled with oil to signify the triumph of good over evil. The 2012 Diwali Festival date is Tuesday, November 13 and in 2013 it is November 3. According to Hindu tradition, the date of Diwali falls on 15th day of the dark fortnight in the Hindu month of Kartik, or on the amavasya, the new moon that falls during the sign Scorpio in the western calendar, in October~November. During Diwali, celebrants wear new clothes and share sweets and snacks with family members and friends. Most Indian business communities begin the new fiscal year on the first day of Diwali. The Diwali Festival is celebrated over five days, while the third day is celebrated as the main Festival of Lights. On this auspicious day, people light up diyas and candles all around their house, and perform Lakshmi Puja in the evening seeking divine blessings of the goddess of wealth. The festival of Diwali also involves colorful fireworks displays and the exchange of gifts to dear ones. 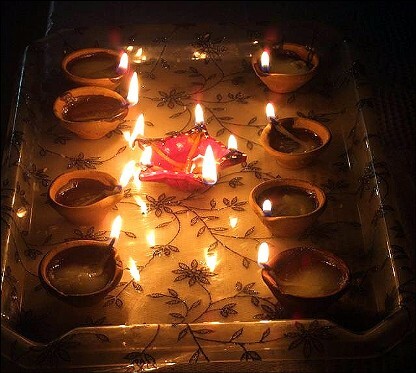 The lighting of earthen diyas (lamps) is a way of honoring God for the recent harvest and attainment of health, wealth, knowledge, peace, valor and fame. They express their happiness also by decorating their homes, bursting firecrackers and partaking in a sumptuous feast. In villages cattle are adorned and worshipped by farmers as they form the main source of their income. In south India cows are offered special veneration as they are supposed to be the incarnation of the goddess Lakshmi and therefore they are adorned and worshipped on this day. Lakshmi Puja is performed in the evenings when tiny diyas of clay are lighted to drive away the shadows of evil spirits, devotional songs in praise of Lakshmi are sung and Naivedya of traditional sweets is offered to the goddess. Diwali commemorates the return of Lord Rama along with Sita and Lakshman from his fourteen year long exile and vanquishing the demon-king Ravana. In joyous celebration of the return of their king, the people of Ayodhya illuminated the kingdom with earthen diyas (oil lamps) and burst firecrackers. It symbolizes the victory of righteousness and the lifting of spiritual darkness in celebration of the victory of good over evil ~ and the glory of light. In Jainism, Diwali marks the attainment of moksha or nirvana by Mahavira in 527 BC. In Sikhism, Deepavali commemorates the return of Guru Har Gobind Ji to Amritsar after freeing 52 Hindu kings imprisoned in Fort Gwalior by defeating Emperor Jahangir; the people lit candles and diyas to celebrate his return. This is the reason Sikhs also refer to Deepavali as Bandi Chhorh Divas, "the day of release of detainees." Deepavali is widely celebrated in both India and Nepal. The fifteenth dark night of the month of Ashwin according to Hindu calendar is celebrated with great pomp and vigor by Hindus in India as well as Hindus living abroad. This is the day when, in around 5000 B.C., Lord Rama returned to Ayodhya. The entire kingdom danced in happiness to get back their ideal King. The mighty yet moral Lord Rama ended the era of Asura Ravana in Lanka. He made righteousness and virtue win over vice. Rama's return to Ayodhya marks many events at the same time. Before returning to Ayodhya, Shri Rama had made Bhibhishan the King of Lanka. Keeping in custom of morality he made Sita, his wife, go through the Ordeal of Fire. Sita proved her chastity by coming out of the fire unhindered. Back in Ayodhya, Bharata prepared for the homecoming of his elder brother Rama in as grand way as possible. Bharata, an ideal younger brother, waited eagerly for his brother for 14n long years. He lived like a hermit in a small cottage while his brother was in exile. Therefore, the Bharata Milap episode too becomes significant. Soon after returning to Ayodhya, Bharata himself performed the Rajyabhishek (the King swearing in ceremony) of Shri Rama. Thus, he became king of Ayodhya. It is believed that as Rama returned to Ayodhya, it was a new moon night. People lit their homes and the path along which Lord Rama was expected with diyas. Everywhere could be seen the scintillating effect of lights. They also decorated the pathways with colorful Rangolis and Flower Rangolis. Their joys knew no bounds as their King was coming back. They wore new clothes, danced and sang in his praise. Since then it has become customary to celebrate the day of Rama's return with much enthusiasm. Following the tradition people till today wear new clothes, decorate their homes and pray for Lord Rama to shower his blessings on their loved ones. Even in present times, the night of Amavasya of the month of Ashwin is full of lights of various kinds. Rangolis at the doorstep of many people's homes are still seen. The era of Lord Rama might be over but the liveliness of the celebrations of Diwali is not diminished a bit. Rama, the ancient idol of the heroic ages, represents the embodiment of truth, of morality, the ideal son, the ideal husband, and above all, the ideal king. There were joyous shouts of victory to Rama, as gods from the heavens poured flowers and garlands to celebrate and show their pleasure. Rama ruled Ayodhya wisely. Everyone including animals and trees were happy and contented. Dhanteras marks the first day of five day long Diwali Festival. In the word Dhanteras, "Dhan" means wealth. On Dhanteras the goddess Lakshmi is worshipped to provide prosperity and wellbeing. Hence this day is significant to the business community. This first day of Diwali celebrations is of great importance. In western India, houses and business premises are renovated and decorated. Entrances are made colorful with lovely traditional motifs of Rangoli designs to welcome Lakshmi, the goddess of wealth and prosperity. To indicate her long-awaited arrival, small footprints are drawn with rice flour and vermilion powder all over the houses. Lamps are kept burning all through the night. Believing this day to be auspicious, women traditionally purchase some gold or silver or at least one or two new utensils. It is believed that new Dhan or some form of precious metal is a sign of good luck. Lakshmi Puja is performed in the evening when tiny Diyas of clay are lighted to drive away the shadows of evil spirits. Devotional songs in praise of Lakshmi are also sung. While lighting the diya, worshippers also may ask for the blessings of the goddess Parvati, who is said to have gambled with dice with husband Lord Shiva on the eve of Diwali. The act of lighting the diya can also bring good luck. Worshippers also reflect on their blessings and give thanks while lighting diyas, which can also be a symbol of a person’s own illumination. A very interesting story about Dhanteras says that once the 16 year old son of King Hima was doomed to die, according to his horoscope, by a snake bite on the fourth day of his marriage. On that particular day of his marriage, his young wife did not allow him to sleep. She laid all the ornaments and lots of gold and silver coins in a big heap at the entrance of her husband's boudoir and lighted innumerable lamps all over the place. And she went on telling stories and singing songs. When Yama, the god of death, arrived there in the guise of a serpent, his eyes were blinded by all those brilliant lights and he could not enter the Prince's chamber. So he climbed on top of the heap of the ornaments and coins and sat there whole night listening to the melodious songs. In the morning he quietly went away. Thus the young wife saved her husband from the clutches of death. Since then this day of Dhanteras has come to be known as the day of Yamadeepdaan and lamps are kept burning throughout the night in reverential adoration to Yam, the god of death. On Narak Chaturdasi, the second day, there is a traditional practice of taking an oil bath before sunrise with Uptan, a paste of gram flour and fragrant powders. In northern India, especially in places like Punjab, Diwali is dedicated to the worship of Lord Rama. In Bengal, Kali/Durga, the goddess of strength, is worshipped. Diwali is one of the few Hindu festivals which is celebrated in every part of India. To the Jains, Deepavali has an added significance to the great event of Mahaveera attaining the Eternal Bliss of Nirvaana. So, the day before Diwali is celebrated as Chhoti Diwali ~ Narak Chaturdasi, or Small Diwali. It is Diwali on a smaller scale, with fewer lights lit and fewer fireworks. The morning after Choti Diwali, the women of the house make beautiful, colored rangoli in the doorway and courtyard. Tiny footprints made out of rice paste are a special feature of the rangolis made for Diwali. In Hindu homes, Chhoti Diwali celebrations involve a ritual puja to the goddess Lakshmi and also to Rama in the evening. Songs in honor of the god are sung and aarti is performed. The story goes that the demon king Narakasur ruler of Pragjyotishpur (a province to the South of Nepal) after defeating Lord Indra had snatched away the magnificent earrings of Aditi, the Mother Goddess (the ruler of Suraloka and a relative of Satyabhama, Lord Krishna's wife) and imprisoned sixteen thousand daughters of the gods and saints in his harem. On coming to know about this, Satyabhama was enraged by Narakasura's malevolence towards women, and she appealed to Krishna to give her the golden chance to destroy Narakasura. The legend also says that Narakasura was given a curse that he would be killed by a woman. Krishna granted Satyabhama a boon to fight with Narakasura. With Krishna as the charioteer, Satyabhama entered the battle field. During the war, Krishna swooned for a while, a preordained divinely act adopted to empower Satyabhama to kill the demon. After Narakasura was beheaded, the imprisoned women were released, and Krishna accepted to marry them. So on the day previous to Narakachaturdashi, Lord Krishna's divine intervention led to the killing of the demon, Narakasura and liberation of the imprisoned damsels as well as recovery of the precious earrings of Aditi. As a symbol of that victory Lord Krishna smeared his forehead with the demon king's blood. Krishna returned home in the very early morning of the Narakachaturdashi day. The womenfolk massaged scented oil to his body and gave him a good bath to wash away the filth from his body. Since then the custom of taking bath before sunrise on this day has become a traditional practice specially in Maharashtra. It is interesting to note that Bhudevi, mother of the slain Narakasura, declared that his death should not be a day of mourning but an occasion to celebrate and rejoice. Since then, Deepavali is being celebrated by people every year with joyous celebrations with lot of fun and frolic, and fire works. In south India that victory of the divine over the mundane is celebrated in a very peculiar way. People wake up before sunrise prepare a paste by mixing Kumkum in oil, symbolizing blood and after breaking a bitter fruit that represents the head of the demon King that was smashed by Krishna, apply that mixture on their foreheads. Then they have an oil bath using sandalwood paste. The primary or third day of Diwali festival is the most important one, for Lakshmi Puja and is entirely devoted to the goddess Lakshmi. On this day the sun passes Libra which is represented by the Balance or scale. Hence, this design of Libra is believed to have suggested the balancing of account books and their closing. The day of Lakshmi Puja falls on the dark night of Amavasya. The strains of joyous sounds of bells and drums float from the temples as people invoke the goddess Lakshmi in a wonderous, holy pouring in of their hearts. 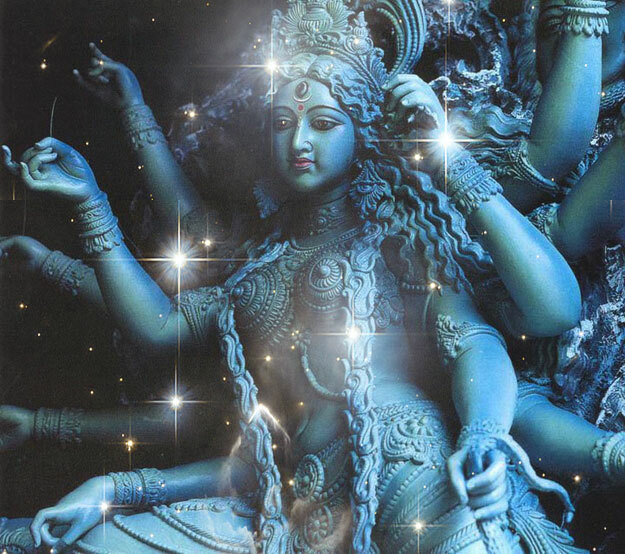 All of a sudden the impenetrable darkness is pierced by innumerable rays of light for just a moment and the next moment a blaze of light descends down to earth from heaven as the golden-footed Lakshmi alights on earth in all her celestial glory amidst chantings of Vedic hymns. A sublime light of knowledge dawns upon humanity and this self enlightenment is expressed through the twinkling lamps that illuminate the palaces of the wealthy as well as the lowly abodes of the poor. It is believed that on this day Lakshmi walks through the green fields and lshowers her blessings on humanity for plenty and prosperity. 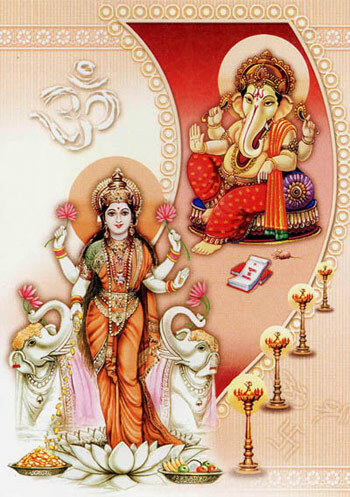 Lakshmi Puja ~ the worship of the goddess of wealth ~ is the main event on Diwali in north and west India. It is extremely important to keep the house spotlessly clean and pure at this time. The goddess Lakshmi prefers cleanliness, and she is said to visit the cleanest house first. This is also the reason why the broom is worshipped on this day with offerings of haldi and kumkum (turmeric and vermilion). Lamps are lit in the evening to welcome Lakshmi. They are believed to light up her path. Lakshmi Puja consists of a combined puja of five deities: Ganesha is worshipped at the beginning of every auspicious act as Vighnaharta; Lakshmi is worshipped in her three forms ~ Mahalakshmi, the goddess of wealth and money, Mahasaraswati, the goddess of books and learning, and Mahakali; Kuber, the treasurer of the gods, is also worshipped. Govardhan-Puja is also performed in the north on the fourth day. This day is also observed as Annakoot meaning mountain of food. In temples, especially in Mathura and Nathadwara, the deities are given milk baths and dressed in shining attires with ornaments of dazzling diamonds, pearls, rubies and other precious stones. After prayers and traditional worship, innumerable varieties of delicious sweets are offered to the deities and then the devotees approach and take Prasad. The Fourth day is called Padwa and marks the coronation of King Vikramaditya and Vikaram-Samvat was started from this Padwa day. The day after the Lakshmi Puja, most families celebrate the new year by dressing in new clothes, wearing jewelery and visiting family members and business colleagues to give them sweets, dry fruits and gifts. Gudi Padwa is symbolic of love and devotion between the wife and husband. On this day newly married daughters with their husbands are invited for special meals and given presents. In olden days brothers went to fetch their sisters from their in-laws home for this important day. Govardhan Puja is also performed in the north on this day. Govardhan is a small hillock in Braj, near Mathura, and on this day of Diwali people of Punjab, Haryana, Uttar Pradesh and Bihar build cowdung hillocks, decorate them with flowers, and then worship them. This festival is in commemoration of the lifting of Mount Govardhan by Krishna. The people of Gokul used to celebrate a festival in honor of Lord Indra and worshipped him after the end of every monsoon season but one particular year the young Krishna stopped them from offering prayers to Lord Indra who in terrific anger sent a deluge to submerge Gokul. People were afraid that the downpour was a result of their neglect of Indra. But Krishna assured them that no harm would befall them. He lifted Mount Govardhan with his little finger and sheltered men and beasts from the rain. This gave him the epithet Govardhandhari. After this, Indra accepted the supremacy of Krishna. This day is also observed as Annakoot meaning mountain of food. Pious people keep awake the whole night and cook 56 or 108 different types of food for the bhog, the offering of food to Krishna. In temples the deities are given milk bath, dressed in shining attires with ornaments of dazzling diamonds, pearls, rubies and other precious stones. After the prayers and traditional worship innumerable varieties of delicious sweets are ceremoniously raised in the form of a mountain before the deities as Bhog and then the devotees approach the Mountain of Food and take Prasad from it. The fifth or the last day of Diwali is Bhaiya Dooj, popularly know as Bhai Dooj. The reason why this festival is known as Bhai Dooj is that it falls on the second day after the new moon, that is the Dooj day. And it is a day to pray for the long life of the brother, which is referred as bhayya or bhai. According to religious scriptures, Yamaraj, the god of death, went to visit his sister's house after a long period of separation. His sister, Yami was very happy to see him and welcomed him by putting an auspicious mark on his forehead for his welfare. Yami and Yamraj then shared a meal. He was so pleased with his sister's reception, he proclaimed that every year, on the dooj day, if a sister puts a tilak on her brother's forehead, then no one can harm her brother. To date, this tradition is followed. Sisters perform puja for their brothers' safety and well being. Brothers in return give gifts to their sisters as a token of love. Lord Krishna, after killing Narakasur, the asura king, went to meet his sister Subhadra. Subhadra welcomed him in the traditional way by showing him a light and putting on his forehead a tilak of her sisterly protection. Another legend says that Bhagawaan Mahavir found nirvana, his brother Raja Nandivardhan was very say and missed his brother a lot. Sister Sudarshana then comforted his brother. Since then, women have been revered during this festival. The festival of Diwali is incomplete without bhai dooj. The essence of the Bhai dooj festival is that it is celebrated to strengthen the love between brothers and sisters. It is a day of food-sharing, gift-giving and reaching out to the inner most depths of the hearts. Brothers and sisters indulge themselves on this day by gifting each other gifts. Varied gifts specially meant for bhai dooj is available in the market. The goddess Lakshmi is revered in every Hindu household. In many Hindu homes it is a custom for the wife to put the red tilak on the forehead of her husband, garland him and do his "Aarti" with a prayer for his long life. In appreciation of all the tender care that the wife showers on him, the husband gives her a costly gift. This Gudi Padwa is symbolic of love and devotion between the wife and husband. On this day newly married daughters with their husbands are invited for special meals and given presents. The Diwali celebration is a very happy occasion for all. Diwali is the festival of Lakshmi, goddess of prosperity and wealth. It is believed that Lakshmi visits everyone during Diwali and brings peace and prosperity to all. 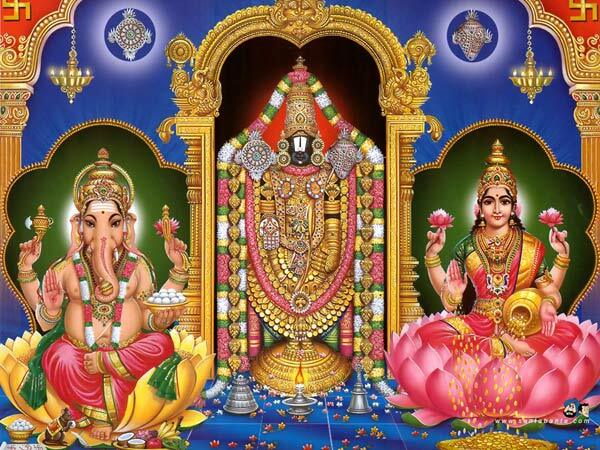 On the night of Diwali Lakshmi-Puja is performed in the evenings. A traditional Pujan is performed after sunset in all the homes. Five ghee diyas (lamps) are lit in front of the deities, naivedya of traditional sweets is offered to the goddess Lakshmi and devotional songs are sung in praise of her. After Deepawali Puja, people light lamps in their homes to usher in light and clear the darkness from the world. Diwali information in this piece comes from the above listed sites. Quote at top of page is a traditional Diwali blessing.